My monastic vocation, as it has developed and matured over the years, is intimately bound up with the lives of my brother priests and with their desire for holiness. The Wednesday of Holy Week invites me to meditate on one priest's abject failure, on one priest's sordid betrayal of Our Lord, on one priest's headlong plunge into the darkness of despair. You all know this priest. His name was Judas Iscariot. What I am about to share applies not only to priests; it applies, in some way, to everyone. Each of us is called to live in the friendship of Jesus. Each of us is called to holiness. Each of us is called to become nothing less than a saint. The Wednesday of Holy Week is designated Spy Wednesday: this because it commemorates Judas Iscariot's conspiracy to betray Jesus for thirty pieces of silver. The betrayal of Jesus by Judas --his friend, his chosen one, his priest-- continues to astonish and grieve us. Why did Our Lord allow such an evil? Why did He not stop Judas, confront him with the horror of his sin, and pull him back from the abyss of iniquity about to open beneath his feet? What a mystery it is that Our Lord should so respect the free will of a man, even when that man's choices are misguided; motivated by the desire for power, or money, or pleasure; or manipulated by Satan, the father of lies! Let us consider, for a moment, what might have happened, had Judas taken the risk of stepping out of his isolation, of reaching out to another. Why did Judas end the way he did? How did he go from giving up everything to follow Jesus, to betraying Him for a miserable thirty pieces of silver? The beginning of Judas' downfall was his secrecy. In the beginning of his discipleship, Judas Iscariot was, perhaps, more open, sharing with Jesus his thoughts, his dreams, his desires, and his fears. And then, little by little, Judas became disillusioned and jaded. He withdrew into himself. He dissimulated his temptations, his fears, his struggles, and his failures. Something very similar happens when a soul stops going to confession, or confesses too infrequently, or puts off going to confession. One becomes accustomed to living with the sickness of one's secrets. One adjusts to living with them, and they poison us. This is something that the Church has always known. How important it is to lay bare our souls to a trusted spiritual father, to admit not only our sins, but also our temptations and our struggles. This act of humility disarms Satan, and renders him powerless. Only pride, and the secrecy that comes from pride and seeks to dissimulate sin, gives the Evil One a foothold in us. Judas must have stopped conversing with Jesus in a personal way. Certainly he continued talking to Jesus superficially, but mostly about business. He was, after all, responsible for administering the common fund of the Twelve. He stopped relating to Jesus in a personal way, as one trusting friend talks to another, heart to heart. It is very telling that in Saint John's Gospel, Judas speaks rather caustically about expenses. He sounds calculating and disgruntled. "Why," he asked, "was this ointment not sold for three hundred denarii and given to the poor?" 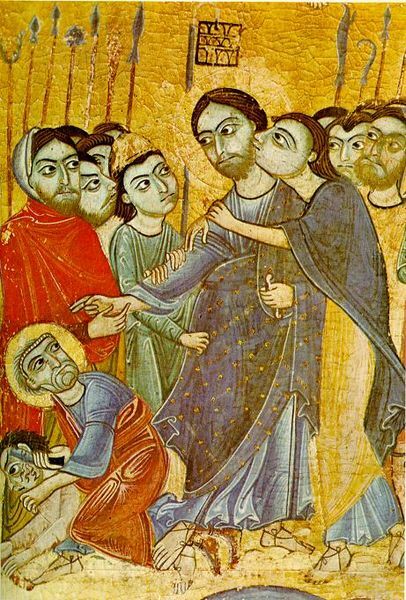 (Jn 12:5) Judas had become all business. There was little love left in his heart. He was concerned about running a successful operation in worldly terms, but in his heart a viper was hid, and it was about to sting him with its deadly poison. If only Judas had gone to Jesus and said, "Master, I need to talk to Thee. I want to open my heart to Thee. I am troubled, and tempted, and on the verge of committing a very great evil. Save me, lest I perish. Hold me fast, my Jesus, and do not let me go. I trust in Thy love for me. I believe in Thy mercy. I remember what Thou didst say one day: "All that the Father gives Me will come to Me; and him who comes to Me I will not cast out" (Jn 6:37). It is never too late to stop and open one's heart to Jesus in the intimate conversation that we call prayer. The worst betrayals, the most heinous crimes, and the living death of mortal sin begin their gestation when we forsake prayer, when we stop conversing with Jesus, or only deal with Him when we are obliged to do so by convention or routine. Then, there is no more friendship with Him. There is only business. And so the heart grows hard and cold. Judas had another recourse, but he was too proud to make use of it. He could have gone to Mary, the Mother of Jesus. Even before the words of Our Lord to Saint John from the Cross, "Behold, thy mother" (Jn 19:27), Mary was a true mother to each of the Apostles. She knew them as any mother knows her children, and she loved them, even with their weaknesses and repeated failures to believe in her Son, to hope in Him, and to love Him. Any one of the twelve could have gone to Mary at any time for counsel, for comfort, for encouragement, and for a mother's blessing. She loved each of them because her Son loved them, and chose them, and called them to leave all things and follow Him. Judas could have gone to Mary and said, "Mother, behold, my life is filled with wicked desires, with anger, and jealousy, and pride. Mother, I am ashamed to confess this to thee, but I am losing confidence in thy Son. I cannot accept His way of doing things. I am hardening my heart against His teachings. Mother, help me! And Mary, moved by an immense compassion, would have caressed his cheek, and opened her hands in prayer over his head. Mary was then, and remains even now for us, the Mediatrix of All Graces, the Mother of Mercy, the Refuge of Sinners, our life, our sweetness, and above all, our hope in this valley of tears. She would not have condemned Judas. She would not have been angry with him. She would have felt an immense pity for him, the pity of a mother for a wayward child. Mary could have saved him from the terrible fate that awaited him. But Judas did not seek her out. And so Mary would weep for him bitterly. One can go to Mary at any moment, with any temptation, any weakness, and any sin. Our Lady hates sin, but loves poor sinners. She is disgusted by evil, but is merciful towards those held in its grip. She is repulsed by vice, but full of compassion for those who struggle to become free of it. Seeing us in our sins, she weeps over us, allowing her tears to soften and purify our hearts. Turn to her and she will crush the head of the serpent who plots our ruin. It is enough to look at her image with confidence, enough to say her blessed name, "Mary, Mary!" Judas could have gone to Peter. Peter had already emerged as the spokesman of the Twelve. Judas could have said to Peter, "Peter, my brother, tonight, let us get together for a glass of wine and a plate of figs. I need to talk. I am confused, troubled, restless. Hear me out. Help me." Peter was often outspoken, and impetuous, but he had a tender side as well. He was capable of compassion. Peter would have listened to Judas. He may have argued with him, as one brother argues with another. He may have reproved him as Padre Pio so often reproved his penitents in order to win them back. But the simple fact of opening up to Peter might have saved Judas. Instead, Judas chose to live with his secret. In the end, it would kill Jesus and cause Judas to hang himself. It a dangerous thing to hold on to one's secrets, to entertain an inner life populated by demons and noisy with their evil suggestions. There is a solution: it is enough to go to one who represents Jesus, one who so knows the Heart of the Master that he can speak on His behalf and pull us back from the precipice. Judas could have gone to John. John was Jesus' beloved friend, the one with whom He shared all the secrets of His Sacred Heart, the friend in whose company He found comfort and solace, the friend who would remain with Him even on Golgotha, the friend to whom He would entrust His All-Holy Mother. John was, and is, a powerful intercessor with the Heart of Jesus. Had Judas gone to John and exposed his temptations, John would have spoken to him of the gentleness of the Master, of the love of His Heart, of His readiness to forgive. And John, interceding, would have gone to Jesus, to speak to Him on Judas' behalf. But Judas could not bring himself to do this. Out of pride certainly, out of jealousy perhaps. And so he went his dark way into the night of betrayal and death. Judas remains a tragic mystery. Had he renounced his sin, or had he repented after it, he might have become one of the shining trophies of Divine Mercy in the early Church. Instead he went his dark way, keeping his secrets, and refusing to reach out to Jesus, to Mary, to Peter, to John or to any one of the company of faithful disciples who might have been able to grab hold of his hand and pull him back from the infernal pit. The very act of reaching out is an expression of humility, and humility opens the floodgates of Divine Mercy. Apart from an abiding trust in the Mercy of God, one cannot have but a tragic destiny. Merciful Jesus, save us, lest we, like Judas, betray Thee with a kiss! Your comments strike close as I was just discussing the betrayal of Judas with my spiritual director (a Benedictine from the ArchAbbey of St. Vincent in Latrobe, Pa.) Many do not see clearly that our God freely lets us choose our path. Woe to us when we marginalize our sins and then despair. Those acts of attending the Holy Sacraments and spending time in Adoration give us ability to reach out in trust to the God who waits to embrace us. I puzzle how to make this clear to the many who more often become like Judas jaded in their lives.